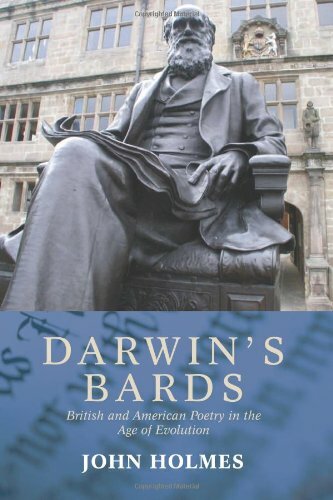 Darwin's Bards is the first comprehensive study of how poets have responded to the ideas of Charles Darwin in over fifty years. John Holmes argues that poetry can have a profound impact on how we think and feel about the Darwinian condition. Is a Darwinian universe necessarily a godless one? If not, what might Darwinism tell us about the nature of God? Is Darwinism compatible with immortality, and if not, how can we face our own deaths or the loss of those we love? What is our own place in the Darwinian universe, and our ecological role here on earth? How does our kinship with other animals affect how we see them? How does the fact that we are animals ourselves alter how we think about our own desires, love and sexual morality? All told, is life in a Darwinian universe grounds for celebration or despair? Holmes explores the ways in which some of the most perceptive and powerful British and American poets of the last hundred-and-fifty years have grappled with these questions, from Alfred Tennyson, Robert Browning and Thomas Hardy, through Robert Frost and Edna St Vincent Millay, to Ted Hughes, Thom Gunn, Amy Clampitt and Edwin Morgan. Reading their poetry, we too can experience what it can mean to live in a Darwinian world. 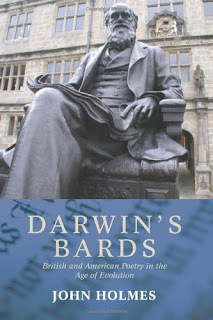 Written in an accessible and engaging style, and aimed at scientists, theologians, philosophers and ecologists as well as poets, critics and students of literature, Darwin's Bards is a timely intervention into the heated debates over Darwin's legacy for religion, ecology and the arts. Find out more about A.R. Ammons in The Paris Review interview as well as with Philip Fried of the Manhattan Review. Meanwhile continue your voyage following in the HMS Beagles wake. Luck would have it that my contribution this week fits in perfectly with your post. Jemmy Button and the fictitious seaman Mallory were on the Beagle... though Darwin isn't mentioned in the Argentine novel "Tierra del Fuego".